I do not have many words left this week, and I have been a bit verbose and academic lately, so this week I think I will show some photos from my collection. The Tiroler Landesmuseum, Innsbruck has a large collection of arms and armour from graves on display in its basement including these helmets. 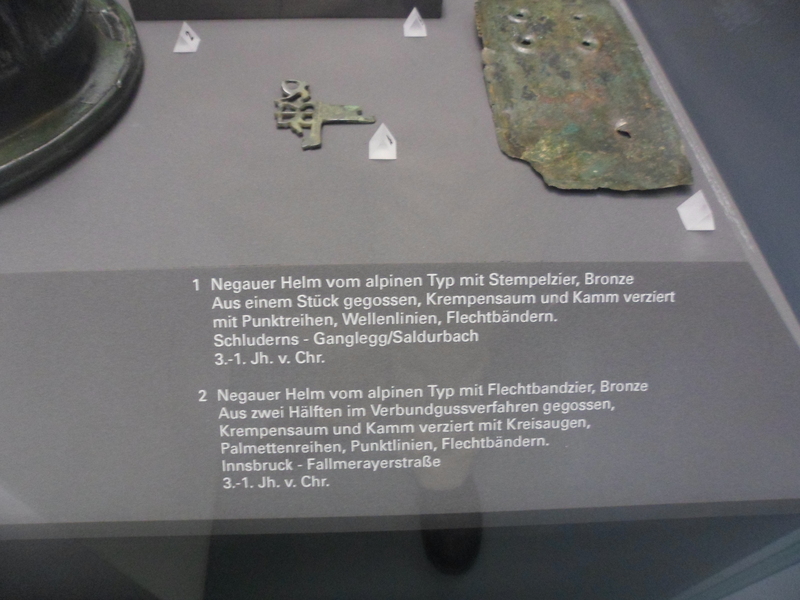 The Negau helmets are named after a group found in Styria in 1811. Archaeology in Britain and central Europe got started a bit too early for modern tastes, so that many important sites were excavated very roughly in a search for pretty metal and ceramic and inscribed stone which could be tied to one of the peoples mentioned by Greek and Latin writers or in the Bible. Today the archaeology of Iron Age Europe outside the Roman empire is a ferociously complicated subject, and I will not try to explain it when there are many archaeologists writing books and blogs. A side view of helmet number 1. Photo by Sean Manning. 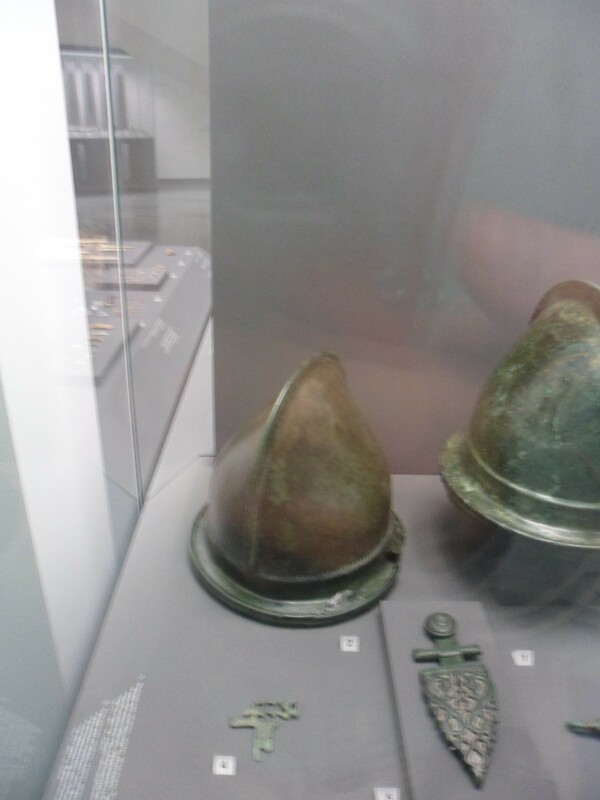 The first helmet was found at Schluderns in the Vinschgau, a place which has come up in this blog before. Before 1919 it was common for archaeological finds from across Tirol to be brought to Innsbruck for conservation and exhibition. A front view of helmet number 1. Photo by Sean Manning, September 2013. The second helmet was found in the Fallermayerstraße in central Innsbruck about 300 metres from the old walled city defined by the Inn and the Marktgraben ‘Market ditch’, Burggraben ‘town ditch’, and Herrengasse ‘lords’ alley’ (link to Google maps). A side view of helmet number 2. Photo by Sean Manning, September 2013. 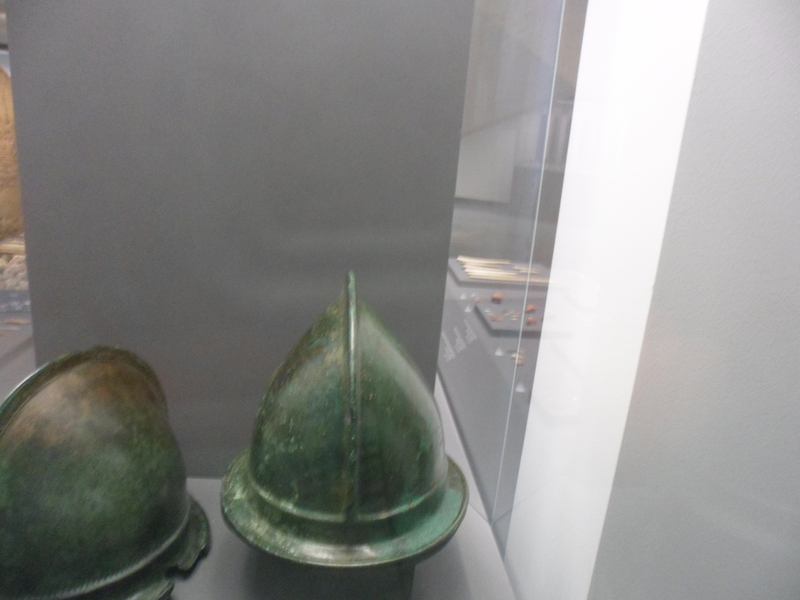 Many people first encountered these helmets as painted in Peter Connolly’s books on Republican Rome at war. 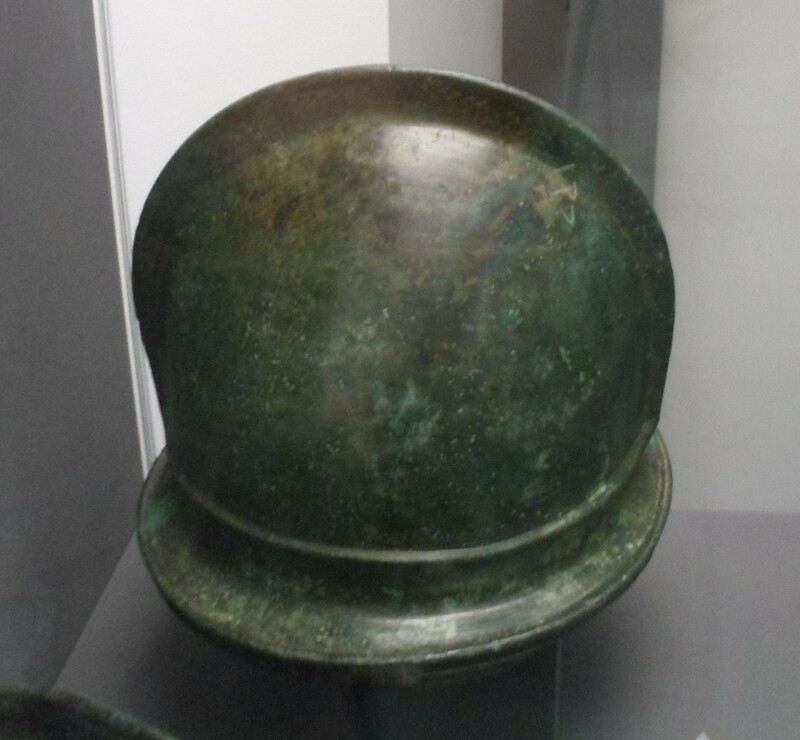 The basic idea of a thimble-shaped or half-almond-shaped helmet with a slight brim on all sides is extremely widespread, from the Greek pilos ‘felt’ of the fourth century BCE (example c/o Wikimedia Commons) to some morions and cabassets in sixteenth-century Europe (example c/o Wade Allen), or even nineteenth-century Assam (Lord Egerton of Tatton, Indian and Oriental Arms and Armour, no. 226). In most cultures, a common accessory was a set of cheekguards to stop descending diagonal cuts to the face below the helmet. Just having a well-made helmet of good metal was a great advantage in many fights, and the ability to see and breathe clearly were just as important as stopping the unlucky blows which made their way past the shield. 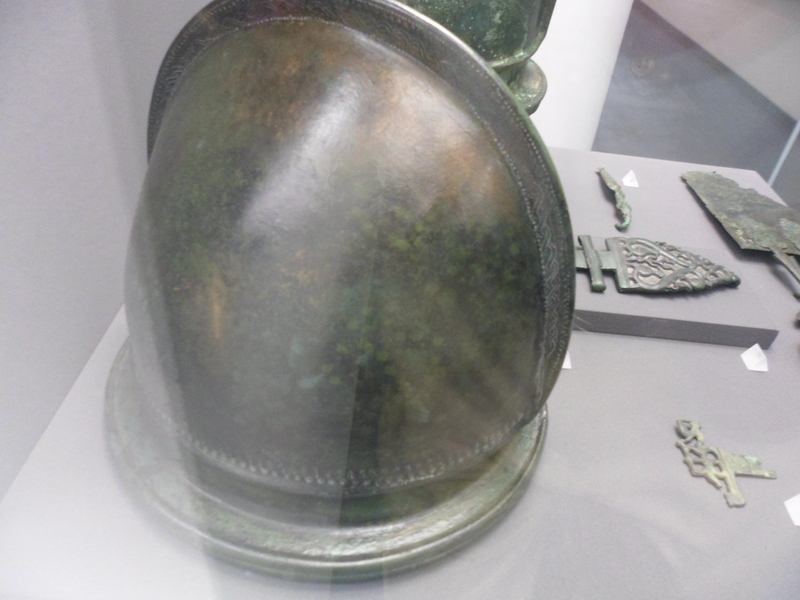 1 Negau helmet of alpine type with stamped adornment, bronze. Cast in one piece, rolled hem and comb adorned with rows of dots, lines of waves, plaited bands. Schluderns- Ganglegg/Saldurbach. 3rd to 1st century BCE. 2 Negau helmet of alpine type adorned with plaited bands, bronze. Cast in two halves with a composite mould, rolled edge and crest decorated with ?round eyes?, rows of palmettes, lines of points, plaited bands. Innsbruck- Fallmerayerstraße. 3rd to 1st century BCE. The jargon of archaeologists and art historians for describing decoration has its own challenges, as many terms are never defined, but I have Englished the museum’s label as best as I can.